The published list of officers of the Royal Artillery shows that John Bradbridge joined the Regiment as a cadet on 6 April 1775, probably when he was 15. He was promoted to 2nd Lieutenant on 27 March 1777,was made 1st Lieutenant on 3rd December 1779 and made the rank of Captain Lieutenant on 24 March 1791. He eventually achieved the rank of Captain on 29th October 1794. As a young officer John Bradbridge was present at the siege of Minorca, which was eventually captured by an allied French and Spanish force in 1882. In his book England's Artillerymen James Alexander Browne describes the conditions that he would have faced. 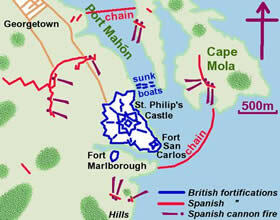 Of the three companies of artillery, which formed part of the garrison of Minorca, there remained but 125 men at the time of the surrender of Port Philip, so reduced were they (in common with the other regiments) by putrid fever, scurvy, and dysentery. Scorning to yield to the enemy before them, they sank and died in the batteries. Perhaps a more tragical scene was never exhibited than that of the march of the garrison of Port Philip through the Spanish and French armies. It consisted of no more than 600 old, decrepit soldiers, 200 seamen, 125 of the Royal Artillery, 20 Corsicans and 25 greeks. The two armies, consisting of 14,000 men, were drawn up in two lines, and as the noble little force passed through them, many of the foreign officers and soldiers shed tears at the emaciated appearance of our men, who, when they had passed through, laid down their arms - their commander, the brave old General Murray, declaring "they had surrendered them to God alone". In the aftermath of the siege of Minorca, the commander in chief - Lieut. Gen. James Murray (left) was court-martialled as a result of 29 charges brought against him by his deputy Lieut. Gen Sir William Draper (below - otherwise famous for the development of the leg-before-wicket rule in cricket). John Bradbridge attended this trial as a witness for Draper and his evidence was documented and subsequently published. The particularly charge that John Bradbridge gave evidence on related to an order given by Murray on October 15th 1781 that; "No gun, or any piece of ordnance, hereafter to be fired in daylight without orders from the commanding Officer of Artiller, who can upon the smallest notice communicate with the Govenor, who is ever watchful"
Lieut.John Bradbridge, of the Royal Artillery, called in, and sworn. Do you remember the order of the 15th October? Whether you lost any opportunities of firing at the working or other parties of the Enemy, in consequence of this order? I lost a great many. Can you name any particular instances? At a time when a party of the Enemy way-laid a party of our people who used to gather greens upon the glacis, there were twenty or thirty men very near the Fort, in a place of concealment: in their retreat I could have galled them very severely, had it not been for the order, as I had three guns which bore upon them. They were in their retreat very wary? They had concealed themselves in a cave to way-lay our people. I saw twenty or thirty of them running away in the morning. They concealed themselves to way-lay our people? Yes: to fire upon our party as they went out. Whether you know of any other instances? I do. At the time the Enemy were erecting a battery at Turk's Mount, I think my shells at the south-west lunette might have retarded their progress. Can you recollect the time; what month it was? It might have been the beginning of October, I think. All the questions of this kind are supposed to be subsequent to the order. I think it was the beginning of October the Enemy were raising that battery. Do you recollect anything that happened in consequence of this order, not previous to it? I have many times perceived many strong parties, at different times, behind a thin wall leading from Stanhope's Tower down to the Barranca, down to the head of the Cove, that, I am sure, might have been annoyed. Did you observe any other instance of the order being improper? In the course of my walking round the garrison at different times, I perceived several instances where the enemy were not annoyed in the manner they might have been. Are the Court-Martial to understand this as subsequent to the order; and that the opportunity was lost in consequence of the order? Did you ever report any observations to Major Walton, in consequence of this? Had you orders to fire, in consequence of that? Whether or not you was not under Capt. Dixon's command? Whether you did not take your guns from the embrasures, reverse them, and fire them over the parapet? I never did. I could not see the wall of Stanhope's Tower, which the General means. Whether at one certain time, when they were ordered tofire incessantly, you did, or not, fire over the parapet, I do not know at what object? Following his promotion to Captain in 1794, John Bradbridge was put in command of the Regiment's 4th Batallion in Gibraltar, where he served from 1896-7. It is documented that whilst Bradbridge was in Gibraltar he was responsible for Lieutenant Colonel Alexander Dickson (Wellington's gunner and one of the Regiment's most famous characters). One of Captain John Bradbridge's responsibilities in 1797 was to arrange the provision of gunners to HMS Terror to assist Lord Nelson in the bombardment of the Spanish fleet at Cadiz in March and May of that year and later to attack Santa Cruz, Tenerife. However, Bradbridge's stay in Gibraltar was short lived for on 27th September 1797, following a General Court Marshal for duelling, he was removed from his post, and dismissed from the Regiment. The details of this event are recorded in James Alexander Browne's history of the Royal Artillery, England's Artillerymen, in which he describes the event as "one of those unfortunate 'affairs of honour'". Captain Bradbridge's adversary was Peter Couture of the Royal Engineers. Couture had previously served in the Royal Artillery but whilst serving in Canada, had been transferred to the Royal Engineers due to his skill as an engineer. It appears that Bradbridge and Couture were friends until the Sunday morning in question, when both men were marching their companies back from church. Browne reports that when passing through Prince Edward's gate, Couture without waiting for the artillery to go straight ahead to their barracks, gave the order "left wheel", which caused Couture's company to break through the ranks of the artillerymen. Captain Bradbridge, it appears, took this as a personal insult and threw his glove at Couture, which the latter instantly picked up. The result was that Couture was killed and Bradbridge dismissed from the service. What happened in the immediate aftermath of the Court Marshal is uncertain but at some point Bradbridge moved to Shropshire where he married Mary Anne Jones, who came from Llanyblodwel, a small village in Montgomeryshire. What is known is that in 1805 the Bradbridge family were living in Llanymynech, a village straddling the border between Montgomeryshire and Shropshire and only a few miles from Llanyblodwel. It was here that John and Mary Anne's son Augustus was born. Army lists also show that between 1797 and 1804 John Bradbridge was not in the army. However, clues as to his next career move are provided in a letter from a Lieutenant Edward Croxen to Colonel J Kynaston Powell (7 Feb 1804) Croxen, a Lieutenant in the Independent Company at Oswestry was writing on the resignation of the Company's Captain Newenham to express the company's wish to join the Shropshire Volunteers as an artillery company. The letter refers to "Mr. Bradbridge, late a captain in the Royal Artillery, now resident in Oswestry" who would be "desirous of commanding". Croxon asked Powell to apply to the Lieutenancy of the County of Salop "that we may serve as a part of your Corps and on the same terms and allowance... as it was our intention to have been a part of your Corps, but unfortunately we were rather too late in our offer." The next day Colonel Kynaston wrote to Lord Berwick recommending an artillery company in strong terms. Such a company, he emphasised was "much wanted and would be well conducted under Captain Bradbridge". On the 9th February, however, Lord Berwick wrote back to Kynaston revealing that a Mr Martin had also applied to succeed Captain Newenham. "...It would be extremely awkward if Captain Bradbridge's name was sent up by me and at the same time Mr.Martin's name by Mr.Cotes...." wrote Lord Berwick. What happens next is uncertain. On 12 October 1804 a John Bradbridge signed up as a Lieutenant with the Kings Liverpool Regiment of Foot. He is listed as a Lieutenant until 1809, when he gained the rank of Captain. This is most likely to have been John Bradbridge signing on at a lower rank but could also theoretically have been John Jones Bradbridge, although in 1804 he would only have been 16 years old. In any case, this would appear to be how the Bradbridge family ended up moving to Liverpool where they remained until the 1850s. On 12th September 1811 a Lieutenant John Bradbridge is also listed as signing on with the 8th Regiment. This will most likely have been John Jones Bradbridge although it's not clear whether it's John Jones signing on for the first time or the second time. However, a clue can be gleaned from an article in the Java Goverment Gazzette from 1812 which refers to a John Bradbridge being promoted to Captain on September 17, 1811 (not 1809 as listed in Army Records). John Jones Bradbridge saw active service during the Regiment's North American Campaign in 1813-14 (part of the so-called "War of 1812"). He was present at the siege of Fort Erie (August and September, 1814), and was made prisoner while opposing a sortie made by the American forces on the 17th September. A published history of the Regiment contains the following account of the events of that day. "During the afternoon of the 17th of September, when the King's, commanded by Lieutenant-Colonel Ogilvie, was on duty, the Americans sallied from their works and attacked the British posts with overwhelming numbers. The King's suffered severely on this occasion, and the enemy gained some advantage*, but was eventually driven back with great loss. Lieutenant-Colonel Ogilvie was thanked by Lieutenant- Greneral Drummond, for his conduct on this occasion. The regiment had Lieutenant Barston, one serjeant, and twelve rank and file killed ; Lieutenant Lowry and twelve rank and file wounded; Captain Bradbridge, Lieutenemt Mc Nair, Ensign Matthewson, eight Serjeants, and sixty-three rank and file missing". Bradbridge was taken prisoner by the Americans but was released and made it back to the UK. In 1817 Bradbridge was stationed in Dublin and it was here that he was subjected to the second court martial of his career. The Court Martial, held on 21st October 1817 and continued by adjournment on the 28th of that month, related to the behaviour of Bradbridge and two other officers, Captain Peter Moyle and Captain Edward Davis relating to a contract made by the Commanding Officer for the supply of bread to the regiment, which was to run from 25th August to 24th Septembeer that year. Specifically the three officers were accused of a) conduct subversive of military discipline by ordering their Pay Serjeants not to receive and prohibiting their companies from receiving the bread provided under the contract b) being in open violation of the authority of their commanding officer by bringing bread into the barracks on 17th September, which had previously been sent out by the commanding officer and supplying it to their companies contrary to the contract arranged by the commanding officer and c) "conduct highly irregular and unofficerlike" by ordering two days later on 19th September a Quartermaster called Kiernan not to distribute bread to their companies under the existing contract. All three men were found guilty of the charges and sentenced to be fined. Despite this, the Court made reference to the exemplary characters of the three men and recommended leniency in their handling. In the event John Bradbridge was based on half pay with effect from 23 December 1817. During this period he is specifically referred to in army lists as John Jones Bradbridge. 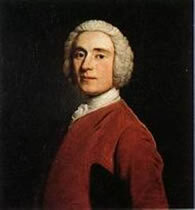 John Jones Bradbridge died Naples in 1824. He remained in the army until his death.